Over a year ago, my dear friend Mandy found out that her colon cancer returned and not in good places. It decided to take up residence in her liver, spleen, and lungs. So, I did what a crocheter does, and made her a blanket. My dear friend Mandy with her Modern Mint Throw I made her. She still is fighting with everything she’s got. A lot of chemo, but she also had major surgery a few months ago on her liver. She has the most amazing attitude and outlook on life and I know she will beat this cancer. She writes about her experiences on her blog Partying Past Prognosis if you want to read more about her and her wonderful family. But there is something else I’d really like you to know about Mandy, she loves crochet. Not, loves TO crochet, just loves crochet, and she is the one who taught me how important a handmade crocheted blanket can become in a persons life. Especially a blanket made for a grandchild. 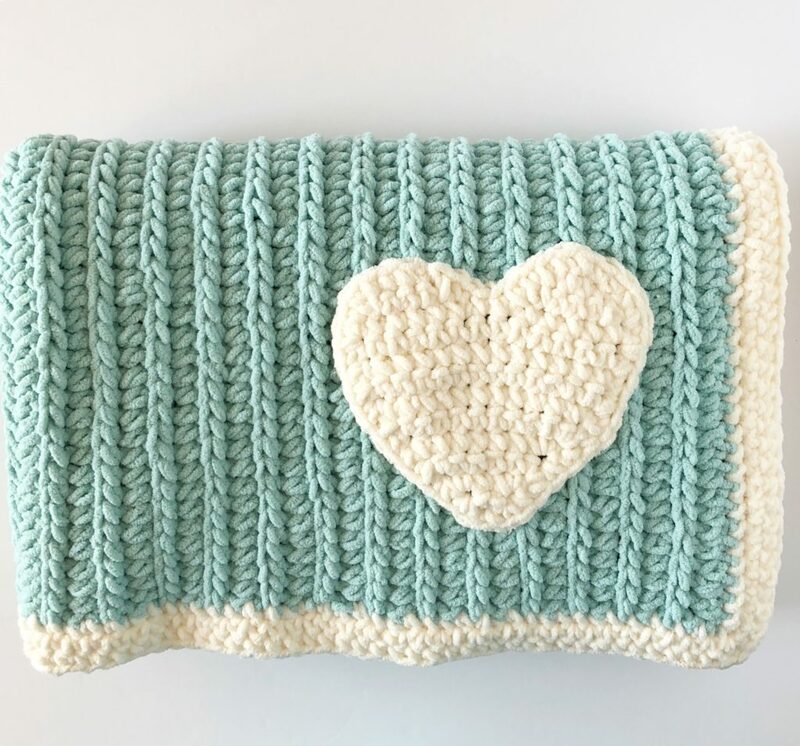 Mandy’s grandmother had made her a blanket when she was a little girl and had always cherished it, so when it came time for her to have her own grandchildren, she wanted one for each of them. Mandy with the crocheted blanket her grandmother made her a long time ago. Mandy insisted that she pay me to make her a blanket. I said no, she didn’t need to pay me, but she insisted and she explained and told me all about her blanket she had from her grandmother and how much it meant to her through the years. She wanted that for her own grandchildren, it was important to her, and she didn’t want it for free. And the next blanket I made for her was the pink gingham. Mandy with her granddaughter Monna and her pink gingham blanket. This pink gingham blanket has become our most popular pattern on Daisy Farm Crafts and for those of you who have made any version of gingham now, it just warms my soul to no end. I love seeing every single one of them. We often say that any Daisy Farm blanket feels like a prayer sent heavenward for the reason I started making blankets in the first place, but now, with Mandy’s current cancer struggle I feel like I want a specific blanket named after her, so when anyone makes it, her name is mentioned. The new name for this blanket is Mandy’s Heart. As Annie and I were over at Mandy’s today taking pictures, laughing and crying all at the same time about how little us, a lover of crochet (her), and a loves to crocheter (me), now have all of you in a little part of our story–we are amazed. We seemed to have found a lot of women and a few men who know exactly how important crochet can be in a person’s life. And we are so grateful for everyone of you for sharing in the love. Going forward, I’d like to rename the Modern Mint Throw to Mandy’s Heart Blanket. (The pattern is below.) And if you do make one, can you stitch a few good thoughts into the universe of healing for her? When they say it’s the little things that matter, this is one of those little things. ROW 1: In the 3rd chain from the hook, HDC (Half Double Crochet-US Terms) and in each chain space across the length of the chain. Chain 1 and turn. ROW 3: In each stitch across the row, work in the back loop only a HDC. CH 1 and turn. Work a final row of HDC (Row 2) and tie off and weave in all ends. Pull up a loop in any corner with Vanilla. Work one SC into the corner and in each space down one side. Be careful to just work one SC per stitch. If you find your blanket is ruffling, your stitches are too close together. Take them out and space them further apart so the blanket lays flat. When you get to the first corner, work 3 SC into the corner space. Work one stitch into each space on the ends. Continue around the blanket working 3 SC into the remaining corner spaces. When you return to the starting corner, work the final two SC and slip stitch and join to the first SC. Chain 1 and turn. Repeat working SC around the blanket for two more rounds in this manner. Tie off and weave in the ends when you are finished. Time to make a heart! (Stop increase) CH 1 and turn, SC in each ST across (13 SC) (Repeat this for 4 more rows). CH 1 and turn. SC in the next 6 stitches. CH 1 and turn, Skip first stitch and SC into the next 5 stitches. Now we will work the other side. Go back to the row you worked the 6 SC, skip a space and pull up a loop in the 8th stitch. SC in each remaining 6 SC to the end of the row. CH 1 and turn, SKIP first stitch, SC in each stitch across (4 SC). CH 1 and continuing in the same direction, work a SC in each space around the entire heart. Slip Stitch into the beginning stitch, tie off and weave in all the ends. With a regular needle, and a white thread. Attach heart to the blanket in the lower corner. I placed the heart so the stripes ran vertically behind it. I found that this blanket didn’t need blocking at all. I played with it and stretched it into shape where it needed it. Of course feel free to hand wash before gifting and follow the washing instructions printed on the label.